The oldest over-the-air broadcasting medium is intersecting with the latest social service to create a unique multi-sensory experience. Real-time Twitter feeds are now available for all major radio shows at UberTalk - the cloud guide to radio. While people listen at UberTalk they'll experience internet interactions with the host including links, photos and commentary along with listener feedback transforming radio into a social experience. 83 of the top 100 radio show hosts are now actively using Twitter to communicate with their listeners both during and after a broadcast. UberTalk is the first service to intertwine the radio and Twitter experience creating a first screen experience for radio. Listeners now have a reason to keep a companion screen open during a broadcast which increases the connection to the host and enhances the experience with other net connections. 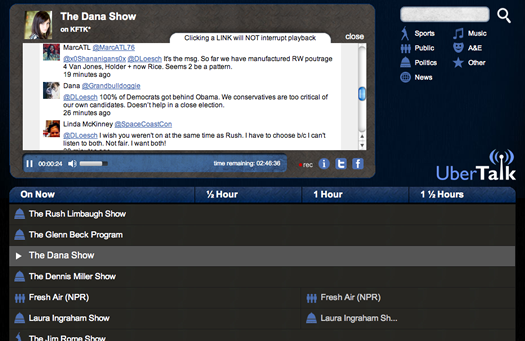 UberTalk is a cloud guide to every show on radio in a familiar TV guide layout. The unique show-centric focus (rather than station) makes it easy to find popular radio shows. The integrated HTML5 player makes it a snap to play any show. All shows are ranked by popularity. Shows are conveniently grouped into categories such as politics, public, sports, news and more. UberTalk with Twitter is available immediately in the browser. Upgrades are under development to bring a similar experience to UberTalk iOS and Android apps.